According to Tourism Industries U.S. International Air Travel Statistics, Americans traveled more during the months of May, June, and July than any other time of year in 2017–and Europe was their number one destination during those months. Because summer is the most popular time for international travel, flight prices tend to be much higher during those months, as do accommodations. For that reason–and to avoid the biggest crowds–we recommend traveling to Italy in the early spring or late fall. Start looking for flights as early as possible and set up alerts to get the lowest prices possible in the off-season. Saving money on flights means more money for food after all. In many, if not most, countries, big cities are hot spots for tourists. They’re the most well-known and often have the most attractions, so it makes a lot of sense. Because of that, they are also generally the most expensive places to visit. This is definitely true in Italy’s most well-known cities like Rome, Florence, and Venice. On top of the higher prices for accommodations and food, they’re also the busiest in terms of foot traffic, which is fun for some…but not all. So, does that mean you shouldn’t see the Vatican, the Venetian Canals, or the famed statue of David? Absolutely not…you just have to be clever about how you do it. If you forego staying within the city’s limits and look just outside of them, you’ll find a plethora of less expensive and just as stunning options–and you’ll be just a scenic train ride away from the big city bustle. In Rome, you could book a charming hotel in Bracciano, Trevignano or Anguillara–three gorgeous towns located about 20 miles and a quick train ride away. In Florence, we recommend choosing a historic villa located in the hills just outside the city. For Venice, take a look at your options in Lido or Mestre, both located outside the city center but close enough to be there as much as you’d like. No matter where you go or what you do, avoid the big chain hotels…they’re both less authentic and more expensive. Let’s be honest…one of the main reasons any of us travels to Italy is for the food! From pasta to gelato to pizza and beyond, there is truly nothing like authentic Italian food, straight from the source. So we certainly aren’t going to tell you to skimp when it comes to dining, but we do have a couple of pieces of advice for how you can get the most pasta for your buck while visiting Italy. To start, definitely do your best to avoid eating in the main tourist areas, where just about everything will be more expensive than it is elsewhere. Next, think about going big at lunch. Many restaurants will offer a reasonably priced fixed menu at the noon hour so you can enjoy three or four courses for much less than you’d pay at dinner time. Then, you can feel extra good about going for a pizza at dinner or consider putting together a little picnic to enjoy in a piazza somewhere. Many Italian cities offer local food markets nearly every day where you can pick up a selection of cheeses, meats, and accoutrements for a steal. 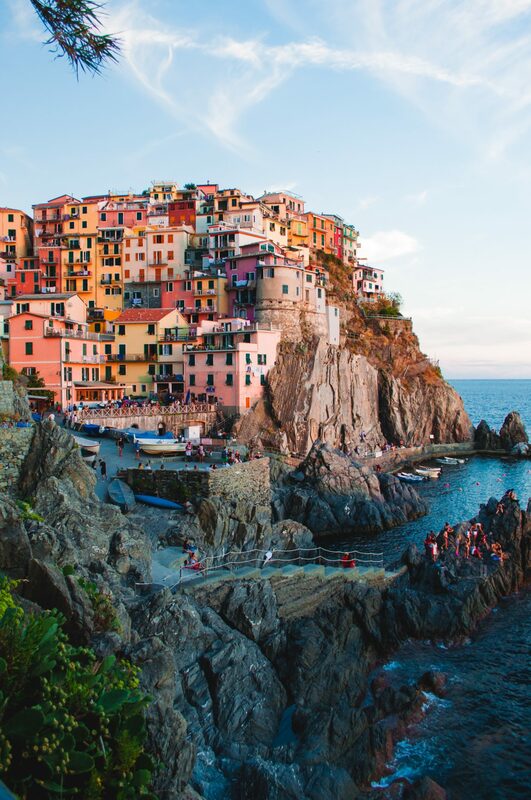 Italy is one of the most beautiful countries in the world, so even just being there to see it is worth the trip itself. That said, we’re sure there are lots of things on your Italian agenda that could end up being costly…but for many, there are less expensive ways to go about them. If you have some flexibility in your itinerary, for example, look ahead at the websites for the museums you’re interested in checking out and see if they offer any free or discounted admission days or cheaper fees for certain credit card holders or specific groups. Most of Italy’s famous churches, cathedrals, and basilicas are free all the time, though you can opt to give a donation if you’d like. Another option is to rent bikes and take on the city you’re visiting and its surrounding areas like a local. If you’re not a big biker, walking tours are generally a low-cost and lovely option for travelers who want to see as much as possible. A little advance research on your must-do and see list could save you a good amount of money. To get you started, here’s a list of free things to do in Rome, Florence, and Venice. When it comes to sightseeing, there is definitely a difference between spots that are simply popular among tourists because they’re so good and tourist traps. In any major Italian city, you’re bound to find a good mix of both, so it’s important that you know how to spot them. If you’re looking for food, do a little price comparison before you sit down to eat. If you notice that one place offers a slice of pizza for double the cost of the place down the street, it’s probably not because their pizza is that much better…they just know that many hungry tourists will sit down and pay for whatever meal is closest to them. When it comes to tours, the more kitsch you see, the more likely it is that it’s a tourist trap. A good example is a Colosseum tour with a person dressed up as a Gladiator selling the tickets. Those people know that tourists love a good photo opportunity, and they’re probably going to up-charge you to get it. Search around before making your choice so you know you’re getting the best possible deal. Have you been to Italy? Share your tips with us on Facebook, Instagram, and Twitter!